A Multitech wireless multi-modem GPRS, MTCBA-H5 line of modems. The specific modem should be chosen based on the region or the country where the system is located (MTCBA-H5-EU in Europe, MTCBA-H5-GB/IE in the UK, or MTCBA-H5-NAM in the U.S.). 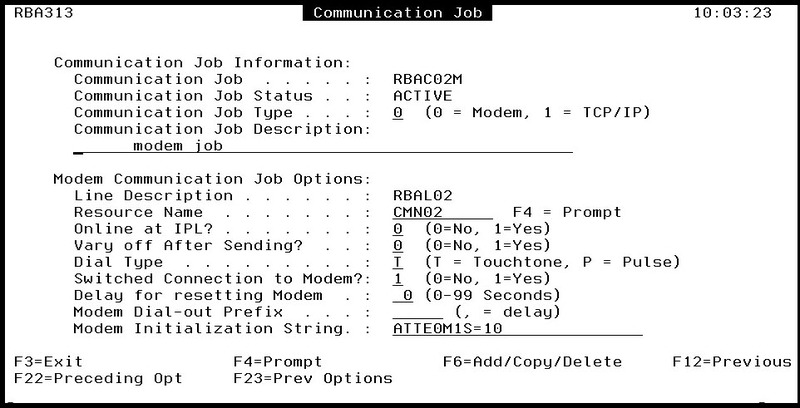 This type of modem uses a Subscriber Identity Module (SIM) card instead of a phone line. A device, such as a cell phone, Blackberry, or PDA, that accepts text messages. Robot Alert version 5.43, or higher. Start Robot Alert and select 6, System Setup Menu. Then, select 2, Maintain Communication Jobs. Press function key F6 to create a communication job. When the Communication Job panel displays, you can use the default values to define your job except for the items shown below. Communication Job Description: Enter a description for the job (optional). Resource Name: Specify the resource the modem will use (press function key 4 for a list of the available resources on your system). Modem Initialization String: Specify a new value for the modem initialization string. In this example, we used the string ATTE0M1S0=10. Press Enter and function key F3 when you're finished. From the Robot Alert Administration Menu, select 3, Directory Menu. Then, select 1, Vendor Maintenance Menu. 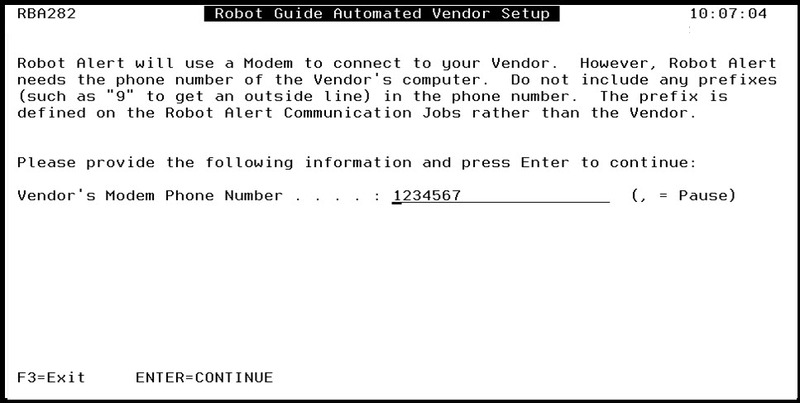 Then, select 1, Create Vendor Using Robot Guide. 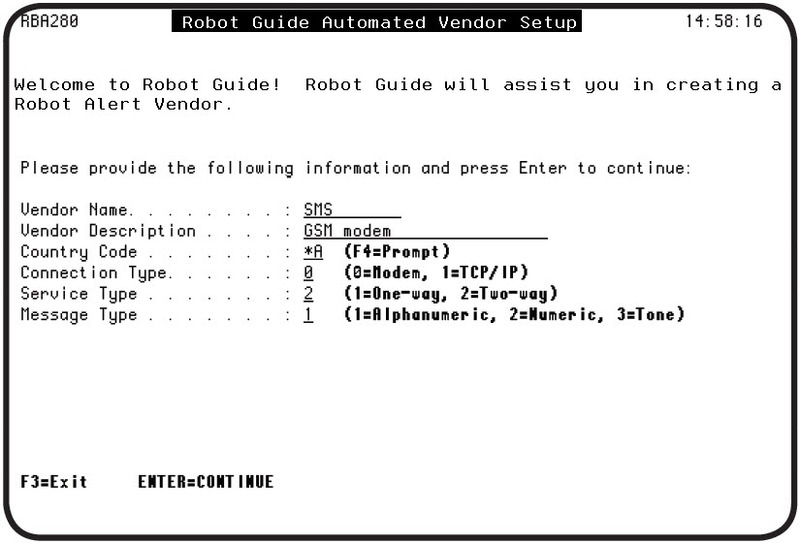 When the Robot Guide Automated Vendor Setup panel displays, enter the information to create your vendor. Vendor Name: Enter the name of the vendor. Vendor Description: Enter a description of the vendor (optional). Country Code: Press function key 4 to prompt the country code and select All Countries. Service Type: Specify the Service Type as Two-way (2). Note: You must specify two-way even though Robot ALERT currently only supports one-way. 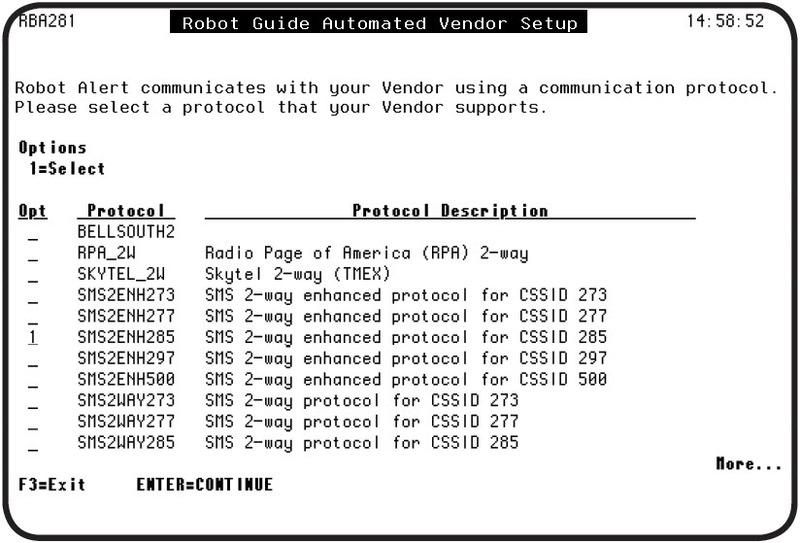 Press Enter and select a protocol from the Robot Guide Automated Vendor Setup panel. 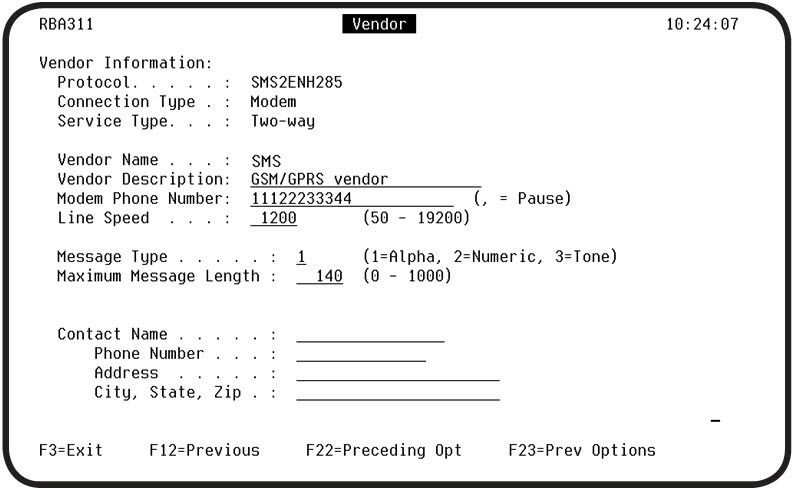 Enter a 1 in the Opt column select the SMS2ENH285 SMS 2-way enhanced protocol for CSSID 285. Press Enter and enter the modem phone number. Enter the phone number for the modem. 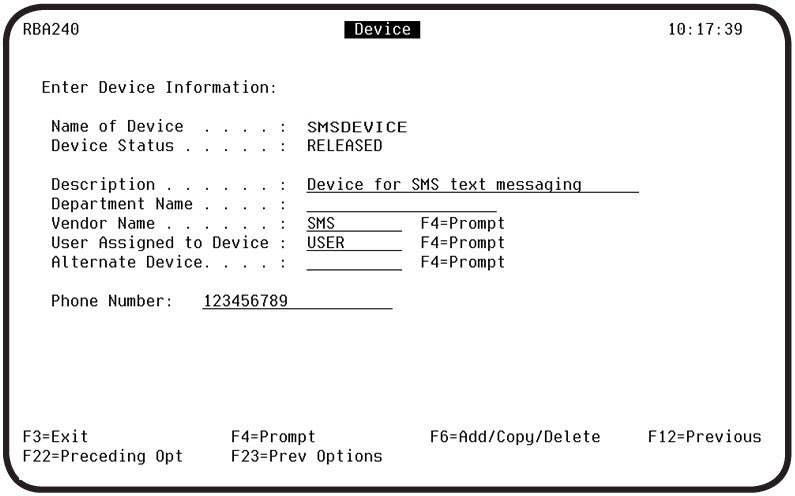 Note: In our tests, we used the number of the Service Center for our text message device. Press Enter twice to continue and to create the device. On the Device panel enter information to describe the device that will receive the text messages. Description: Enter the name of the device, a description (optional), and the name of the department to which the device is assigned (optional). Phone Number: Enter the phone number for the cell phone or device that will receive the message. Press function key F3. Then, select option 2, Maintain Existing Vendors, locate your vendor and use option 1, Select, to edit the vendor information from the Maintain Vendor panel. Line Speed: Change the Line Speed (baud rate) to 1200 and press Enter. Select option 2, Advanced Information to edit the other vendor information from the Maintain Vendor panel. Parity: Change the Parity to NONE. No. of Data Bits per Character: Change the No. of Data Bits per Character value to 8. The Robot Alert library, RBTALRLIB, is in your library list. The communication job you created earlier must be inactive (INACT). The controller (CTL), device (DEV), and line (LIN) that you specified must be varied off. 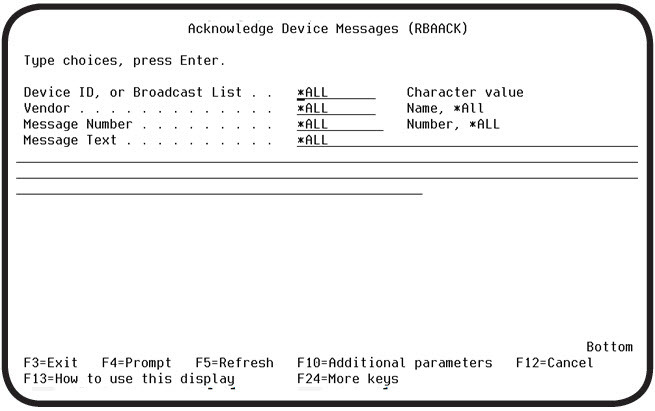 From an IBM i command line, enter the Robot Alert command RBACFGSMS and press function key F4. 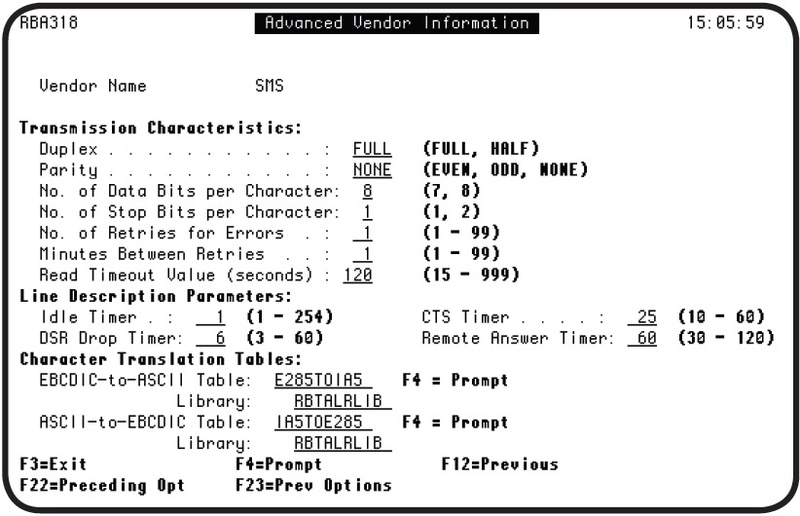 When the Configure SMS 2-Way terminal (RBACFGSMS) panel displays, enter the correct values. Communication Job Name: Enter the name of the communication job you created. Vendor Name: Enter the name of the vendor you created. Configure: Enter 1 to configure the vendor and press Enter. If the command runs successfully, you will see a confirmation message. Press Enter when you're finished. 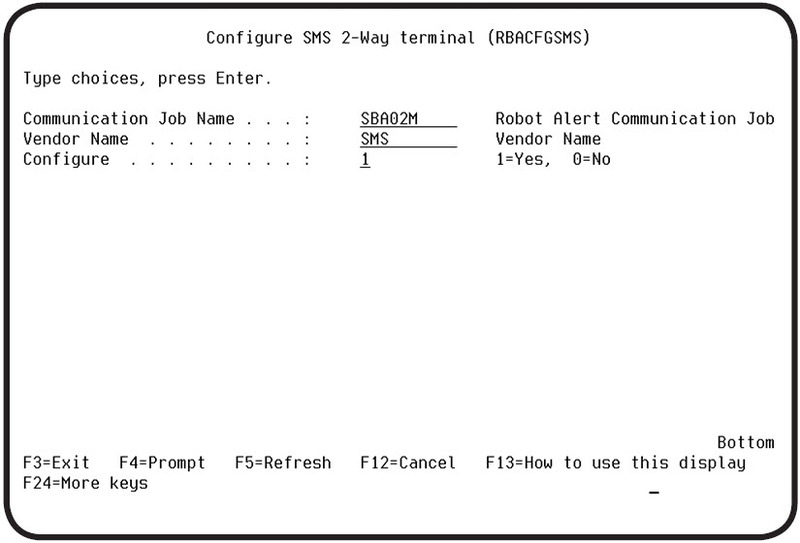 Currently, Robot Alert supports one-way SMS text messaging only. Because we must specify a two-way protocol, the message will repeat. There are many ways you can acknowledge the message to prevent it from repeating. Two of these methods are described below. If you use the Robot Alert RBASNDMSG command to send the message, change the value in the Response Required field to *NO to prevent the message from repeating. Response Required: Change the value of the Response Required field to *No. You can use the Robot Alert RBAACK command to acknowledge the message and prevent it from repeating. Enter the command RBAACK from a command line and press function key F4. 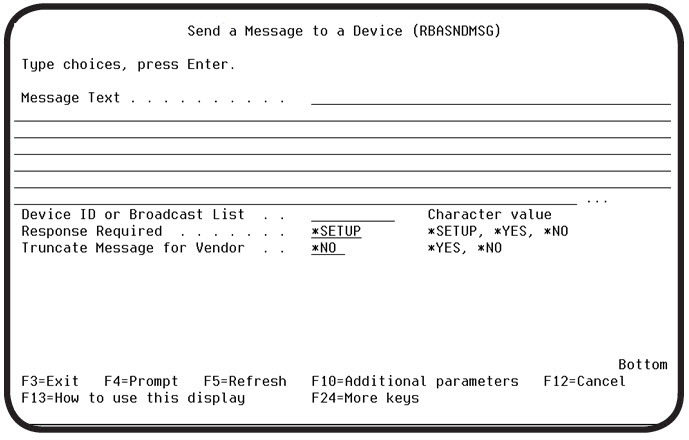 You can select values to limit acknowledgment by device ID, vendor name, message number, or message text. Use *ALL for all pending messages. You can limit messages acknowledged by device ID, vendor name, message number, or message text. Use *ALL (the default value) to acknowledge all messages.